Each year I try to look back on the year that was to see how my dividend growth portfolio performed. Not from a return perspective; rather from a purely dividend growth perspective. Since my goal is to build up a portfolio of excellent companies that pay me cold, hard cash in the form of dividends, to support our lifestyle it's the dividends that are the most important part of the portfolio with capital appreciation taking the backseat. The thing is dividends are much more steady and predictable than capital appreciation for any given year. For instance, I think we all could have made a pretty good guess that McDonald's (MCD) would have paid at least $3.76 per share in dividends during 2017, yet who really saw the share price climbing from around $120 to over $172 as of today. That's why I want to focus on the dividends that my investments pay me each year and how much they grow each year. As of the last week of December, the forward dividends for the companies owned in my FI Portfolio sit at $5,833.07. 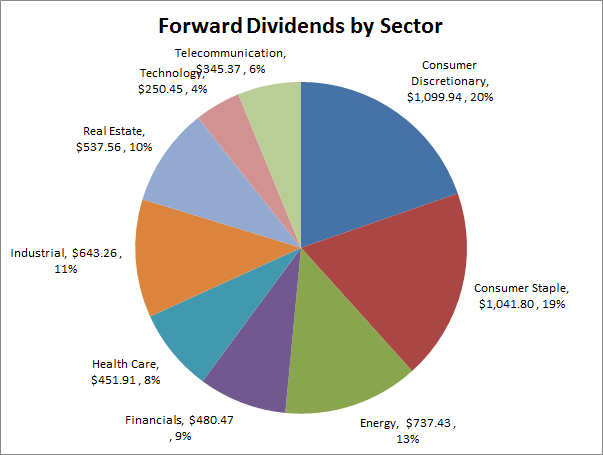 The following chart shows a breakdown of the forward dividends by the economic sector that they fall into. The 2 largest contributors, by sector, to my forward dividends are Consumer Discretionary and Consumer Staples with 20% and 19% weights, respectively. Frankly, that's exactly how I want it to be although I wouldn't mind increasing the weights of the Consumer Staples because there's still some great companies such as Hormel Foods (HRL) and J.M. Smucker (SJM) that I don't yet own. Energy is the next largest sector at 13% of my forward dividends. That's within the range of where I want my energy exposure to be although it's on the high side so I don't plan on increasing my exposure there. Ideally I think the 8-10% range would be a good spot to be in. The Financials, Health Care, Industrials and Real Estate sectors are all very close with 9%, 8%, 11% and 10% weightings, respectively. Health Care is the only sector out of those four that I feel is a bit on the low side. Honestly if I could swap the weightings of Energy and Health Care I'd be a bit happier with my exposure. Both the Technology and Telecommunication sectors have the lowest exposure at 4% and 6%, respectively. The telco sector is quite mature so it's typically reserved for the high current yield low dividend growth stalwarts like AT&T (T) and Verizon (VZ). Although I do own Harris (HRS) which has been a great investment for me thus far. There's a few Technology names that I'd like to add such as Cisco Systems (CSCO) and Qualcomm (QCOM), but overall I think the weightings for each of these sectors is about where I'd like them to be. Think of it as one of those big, multi-room night clubs where there's a hip hop room, an 80's room, a dance/techno room, a country room. Except instead of being able to go to each room the $50 Club members can only stay in the $50 Club, whereas the $100 Club members get to experience the $50 Club and the $100 Club and so on and so on. The $50 Club has 35 members, that means 35 of my holdings provide at least $50 in annual dividends. Sadly 12 of those 35 don't get to venture into any of the other clubs...at least not yet. The $100 Club has 23 members meaning half of my holdings produce at least $100 of dividends each year. Whereas the $200 Club has 10 members with 8 of them on the outside looking in at the $300 Club. The two $300 Club members are in a party all to themselves and consist of McDonald's and Target (TGT). Honestly I think that's a bit of an odd pairing to be my 2 largest contributors to my dividends, but we can thank my former self for taking advantage of adding shares at what I felt were good long term value levels. First off, as of this week I own 46 different companies within my FI Portfolio. Of those 46 companies, 40 of them gave me pay raises throughout the year by either increasing or initiating dividend payments. Unfortunately that means 6 of my holdings decided to not join in on the fun. There were 4 companies that did not increase their dividend payment during 2017. Those 4 are: EOG Resources (EOG), BP plc (BP), Chevron Corporation (CVX) and Deere & Company (DE). While these 4 companies did not raise their dividend payment, they did maintain their dividends throughout the year. It's not too surprising to see 3 companies in the oil/energy sector not increasing their dividend payments considering the persistently low price of oil over the last few years. For those 3 I'm not all that concerned about the long term trajectory of their dividends because cash in the company's bank is much more important for the health of each of those enterprises right now. However, Deere & Company is another story. If my memory serves me right, back in 2015 management at Deere & Company decided to keep the dividend the same as there were very serious concerns about the health of the business, namely the business out of China and the effects of a slowdown there. The reasoning made sense so I was content to just hold and wait for better days and a return to dividend growth; however, that growth is still yet to come. I can't complain too much since Deere has been compounding my investment capital at over a 20% internal rate of return, but the lack of dividend growth is concerning and something I'll have to examine closer in early 2018. Unfortunately, 2 of the companies that I own announced dividend cuts compared to their last payment in 2016. The first one I'm not too concerned about because it came from YUM Brands (YUM) which spun off their Chinese business via YUM China (YUMC). However, the combined dividend payment between the two companies is still a decrease from YUM's payment last year. So it gets thrown into the dividend cut tally albeit with an asterisk. Admittedly the other dividend cut hurt. This one came from General Electric (GE). Earlier this month, management announced a non-too surprising 50% dividend cut to their dividend payment. Ouch! General Electric's share price had front run the dividend cut amid widespread concerns of an impending cash crunch for the company and likely dividend cut. General Electric was a fairly large holding of mine providing over $160 of dividends per year before the cut and now that's down to just over $80 per year. I couldn't help but laugh when the dividend was officially cut and I started seeing articles mentioning that General Electric had only cut the dividend twice since the Great Depression. While that is in fact true, that seems like a bit of a cherry picked point of reference considering they've now cut their dividend twice in the last decade. Despite the very real concerns about General Electric I'm going to stick this one out as I believe the core of the business is still very much intact. Companies go through rough patches all the time and I'll side with the business that's been around for decades and still provides very much needed industrial goods to right the ship over time. After all, companies like McDonald's and Johnson & Johnson (JNJ) were two Dividend Champions that fell out of favor with market participants and have since righted the ship. The 40 companies that announced raises this year combined to dish out 47 total increases with several holdings giving multiple raises throughout the year. February led the way with 7 increases being announced while April, July and September each had 6 each. May was rather disappointing with just 1 increase being announced. Overall it was a solid year in terms of dividend growth. The largest contributor in terms of the weighted dividend growth came from Bank of America (BAC) with a weighted contribution of +0.83%. That was due largely in part by the monster 60% dividend increase they announced. McDonald's was the second largest contributor at +0.46% thanks to solid dividend growth and it's large weighting in my portfolio. 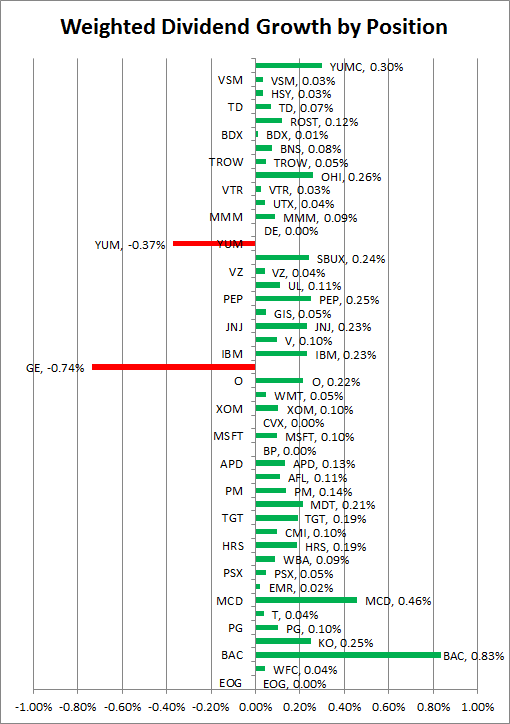 Unfortunately there's 2 of those red bars associated with the two dividend cuts from General Electric and YUM Brands. General Electric in particular was a big drag on the weighted dividend growth for the portfolio with a weighted contribution of -0.74%. Yikes! The weighted dividend growth rate for my portfolio 4.65%. Not all that great if you ask me. Although the 2 dividend cuts played a bit role in that. Those two alone dropped the weighted average growth rate from 5.89%. The 4 companies that kept their dividends flat, namely BP, Chevron and Deere were big drags as well. Among just the companies that announced increases year over year the weighted growth rate came in at 6.68%. For comparison's sake the average dividend growth rate among my holdings accounting for all positions came in at 8.91%. 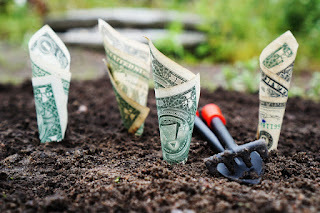 Unfortunately, many of my high dividend growers are also low dividend yielders which means they carry relatively low weight in the portfolio wide dividend growth rate. For example, Visa (V) had a very strong 18.18% increase in their dividend payment, but it only contributed 0.10% to my weighted dividend growth because the yield is typically around 1% or less. Overall I'm fairly happy with how things stand as of the end of 2017. With the last few payments coming in this week I'll eclipse the $900 mark for the second time ever while setting a personal best for dividends received during a month. I'll also be surpassing 2016's total dividends received which I'm glad to see after 2016's decline. Even better news is that regular monthly investment of savings is on the horizon which will really help to juice the dividends received. Looking forward to 2018 I'd love to add more to the Consumer Staples and Health Care sectors; however, that will only happen if the valuations make sense. In the end it's valuation first and foremost to determine which companies get my investment capital. As far as forecasts for 2018 dividend growth I fully expect it to come in higher than 2017's weighted growth rate of 4.65% for several reasons. One, corporate tax reform should provide a boost to dividend growth going forward although I expect most of the tax savings to be spent on share buybacks *sigh*. Also, if I can avoid dividend cuts among my holdings then that alone will boost my weighted dividend growth rate higher and if the no raisers from 2017 return to at least minor bumps higher that will help as well. How did your portfolio's dividend growth turn out for 2017? Better or worse than expected? Were you caught off guard by any dividend cuts? In hindsight I should have gotten out of GE prior to the cut, but I think at this point the risk/reward is skewed to the reward side. Of course like you mentioned it's pretty much a turnaround play now rather than a core dividend growth holding. I'll have some decisions to make regarding GE, but as of now I'm leaning towards just holding on for the ride and seeing how things play out. Nice recap! The charts and graphs are very helpful. I do agree that dividend growth is a key component, but I'd prefer capital appreciation over dividend growth (or both if possible :). The reason I'd prefer capital appreciation is for the potential to sell-off growth winners and then allocate the proceeds to value dividend paying names. Perhaps we're looking to use both methods, but I like fueling the dividend growth fire with capital appreciation and eventually capital gains from other holdings. Don't get me wrong it's still about total return and building the portfolio higher although I have a pretty high tolerance for high valuation especially for core holdings. The valuation has to be quite excessive for me to pull the trigger on selling. But I do try to take the long term approach with core holdings and that means focusing on dividends/dividend growth and monitoring the company. In an ideal scenario the portfolio would be built up enough to where the dividends it spits out can support our lifestyle. Think eating the apples off an apple tree rather than cutting the tree down for the wood. The wood can only be harvested once, but has the potential for a larger short term payoff whereas the apples are the long term approach where you get a little bit each year. Plus when you add in the very big drag of taxes it takes a lot of undervaluation in a new investment candidate to really make it worthwhile. I was right there with you on YUM but I eventually just sold it (along with the China spin off) for the gains and redeployed those earnings into a higher paying stock. While the company still seems like a great investment, my portfolio was too young to take that small of a dividend payment. I was tempted to do the same with YUM/YUMC, but just neglected to do anything with it so now I sit with both companies. Luckily YUMC finally initiated a dividend which helps things out. I have a few positions where the dividends are hardly worth collecting, but it's hard to get rid of them because I have either really high hopes for the long term value or the potential intermediate term value and prospects for capital gains. Great analysis of your portfolio. I was fortunate to not own GE. I sold my YUM and YUMC, but mostly because it was a small part of my portfolio and I don't love the business. My four non-increasers were CVX, GPS, HP, and HCP. Hoping to get something next year from all of them, but we'll see. Overall, I was happy with my portfolio, but I'm not contributing much these days since I'n not working. Would obviously like to see a pullback at some point, but I'm not holding my breath during this bull run. I'm in a similar boat as far as not contributing to the portfolio but that's because we really need to focus on some debt pay down just to free up some base monthly cash flow. Which given the lack of good values out there that's just fine with me. Plus it's the better long term move. I wasn't surprised by CVX's lack of a raise. Figured they would milk that last $0.01 increase they gave for all they could. If they don't increase this year with generally higher oil prices and it would end their streak then it might be time to cut bait. Who knows. Very fun article and I do something similar, internally. Pumped you put this out there. Great way to see how many paid you from the positions you owned, what %'s, who cut, etc.. Mattel stung me this year. BBL has been back and have been on a tear this past year, from their dividend cut a bit of time ago now. Appreciate the article and talk soon. Glad to hear that you check on your portfolio's dividend growth as well. One thing that really stuck out with this years analysis is just how important diversification is. Those cuts from GE and YUM hurt, but thanks to the rest of the portfolio doing it's thing organic dividend growth still came in at a decently healthy 4.7%. Hopefully 2018 will bring some greener pastures on the dividend growth front with no cuts and maybe even some small raises from CVX, DE, BP and EOG to help boost that dividend growth higher. Great way to look at portfolio, thanks for a couple of neat ideas. Where/how do you get div increases info for your stocks by month? Hope you take a look at your own portfolio to see how it's holding up. Regarding the dividend increases I keep track of the date of the last increase in the spreadsheet that I use to track my entire portfolio. It's a bit tedious, but it allows for a deeper look into things which is always fun. If you're curious about your own you can just do a search for the stock symbol of whatever company you want and dividend history. Nasdaq.com and Dividend.com are the two that have lots of data. And of course that company's website. Nice recap. I got hit by the GE cut as well. Not fun, but I guess it will eventually recuperate with time. Yeah, GE is a turnaround play now. So we'll see how it works out, but it's probably going to need a few years would be my guess. That definitely stung, but the good thing is the rest of the portfolio helped to pick up GE's slack. 40 raises received this year, can't be mad about that! Hey JC, loved the post... I read it and got motivated to go calculate the dividend growth for my portfolio as well... for each of the past 3 years, no less! Here are the results: 2015 --> 10.24%, 2016 --> 7.99%, 2017 - 8.64%. As you might imagine, I was rather pleased with the results. Prior to calculating anything, I was using 6% dividend growth in my annual projections, and was hoping to achieve 7%. Knowing the real numbers now, I can project with better accuracy. My portfolio has a rather low yield (~2.5%), and is skewed more towards growth than income. I believe this helped to contribute to the high numbers, as I don't have too many slow growers in the portfolio. 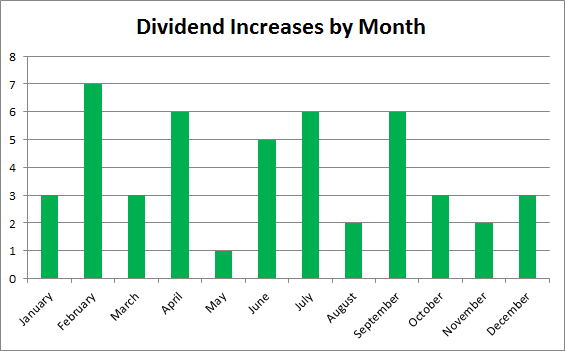 I really enjoyed all the ways you looked at your dividend growth in this post. It was a very fun read with lots of interesting numbers. Thanks!